While at APSE, I sat in on a presentation designed to acquaint participants with the upcoming changes being required by the European Union. It was both enlightening and, given the targets, somewhat scary to contemplate. 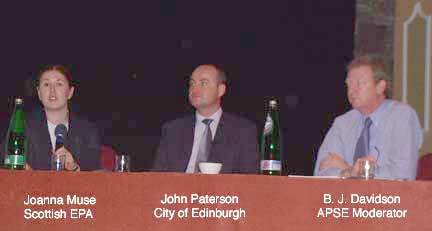 The speakers consisted of Joanna Muse, NWS Operations Support Manager of the Scottish EPA, and John Paterson, Development Manager for the City of Edinburgh Council (John said he had previously held Joanna's job prior to moving back to the Local Authority). 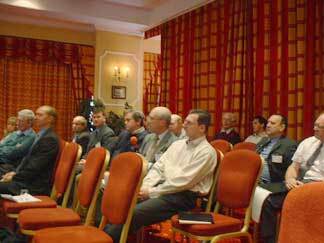 Moderating was Brian (BJ) Davidson, Head of Land Services and Personnel for Scotland's South Ayrshire Council. Although there's no way to cover its entirety, I've attempted to cover the highlights of Ms. Muse's SEPA presentation. She has also promised to send us a pdf file of her presentation for those who would like more information. Once we've received it, you'll find the link placed here. As you will see, Scotland is faced with a difficult challenge, as are most countries, and here's some of what they intend to do about it. Scotland has been recovering, on average, between 5-9% of its waste, and is challenged by the increasing amounts going to landfills. Historically, landfills have been the cheapest waste management option, due to a lack of internalization of the long-term environmental costs. Now, Scotland is looking at the larger picture of waste management. Perhaps the biggest challenge they face is one that virtually everyone can to relate to -- waste is produced everywhere, but no one wants a landfill in their back yard. As part of a SEPA (Scottish Environmental Protection Agency) survey of 1 in every 400 Scottish households, the public was shown to have no idea what happens to their trash after it's picked up. From the sound of it, the word 'magic' might come into play for most individuals when asked how their garbage disappears from the scene. With the enactment of the Environmental Act of 1995, SEPA was given the challenge of developing a strategy for reducing the landfill stream. A Landfill Tax of 7 pounds per ton was introduced, and was scheduled to increase by 1 pound per year. Today, it's at 14 pounds per ton. As a result, the Environmental Act has also provided area interests with a stake in the future of this issue. SEPA is now using Life Cycle Assessment as a tool to assess all waste-related options available to the country. These include the type of bins, type/cost of pickup vehicles, and all other quantifiable factors. Their goal is to come up with answers that speak to the long-term costs, as well as ways to reduce flow. The national target is to increase the amount of waste collected by local authorities to 25% of the total waste stream by 2006. They also want to reduce land filling of biodegradable waste collected by local authorities to 1.5 million tons per year by 2006. Ultimately, the goal is to increase recovery of waste from the 9% seen today to a total of 70% by 2020. Recycled and composted material is targeted to increase from 25% in 2006 to 55% by 2020. Increasing recycling facilities is one option they believe will prove helpful. Accordingly, recycling points will be increasing from 1 site per 1500-2000 households to 1 recycling point per 500 - 750 households. Curbside recycling is slated to rise to 85% by 2010, then increase incrementally to a whopping 90% by 2020. This will require 1.2 million tons of processing capacity. Collection of green waste is targeted to rise to 50% by 2010 and then to 60% by 2020. This will require at least twice their existing facilities. It will also require the development of viable end-use markets and composting standards. Other recovery: SEPA is investigating longer-term options for recovering further value from municipal waste. This includes looking at incineration with energy recovery, anaerobic digestion, pyrolysis, gasification and combined mechanical or biological treatment processes. They are looking at guidelines that will move them away from mass burning options and into recycling and composting methods. 91% of municipal waste in Scotland is now landfilled. This will be reduced to 31% by 2020. There are now approximately 200 active landfill sites throughout Scotland; however, this capacity will be reduced to just 110 by 2007. Cost for municipal waste is now about 70 pounds per ton. They know that this will double by 2020, in terms of total cost, if they do nothing. However, if they succeed in implementing their plan, the cost will be comparable and, on the whole, will comprise a much better management practice. Scotland's budget calls for 230 million pounds to be spent on the issue (throughout the 32 councils in the country) through 2006. In Scotland, municipal waste accounts for just 25% of total waste. The rest is made up of construction, business and demolition types of waste. Unfortunately -- or fortunately, depending upon how one looks at it -- they have discovered huge data gaps in figuring out where the non-municipal waste is coming from. They realize that they can't develop any BMPs until better data is developed. In our next story, I ask Council members from England and Scotland how they decide which sweepers will best meet their needs.